Thankyou all for coming together to share your pretty wares and gorgeous projects last week. Due to my own busy schedule, I have yet to choose this weeks features, but will bring them to you, in all their glory, tomorrow. Meanwhile, let's get on with sharing this week. Please link your pretties projects, vintage finds, lovely heirlooms, wisdom of life, and home cooked recipes so that we can all live elegantly for less. 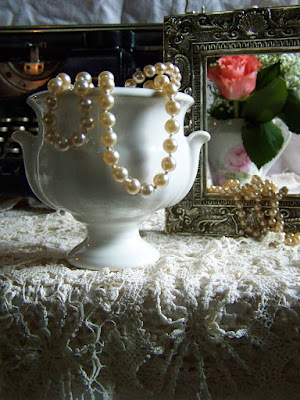 Thank you Mimi for the relaxing music and for Five Star Frugal 17 Vintage Treasures. Thank you for hosting Mimi! See you next week. Thank you Mimi for hosting! Mimi, thanks for another great party. I cannot wait to see our features, I am always so pleasantly surprised! Have a great weekend. Thanks for hosting the party, Mimi! Thanks for hosting and enjoy your weekend Mimi! Great inspirational links here tonight. Thanks for coming over to comment on my Escaping Cherubs cabinet. I rounded them up and came over to party! Fantastic party. Thank you so much for hosting.